Beachview maison juste à côté de la promenade et 2 maisons de la piscine! Cette maison a la convenance du front de mer mais sans l'étiquette de prix! Situé juste à côté de la promenade de la plage, cette maison de bain de 4 chambres à coucher, 2 (plus 3e extérieur) peut accueillir 14 personnes et se trouve à deux maisons de la piscine! Une vue imprenable! Beach House près de la promenade du bord de la piscine et de la plage Prêt pour quelques "changements d'attitude"? Cette maison d'un étage dispose d'un plan d'étage ouvert avec un salon et salle à manger et une cuisine bien équipée. Situé du côté du golfe de la pittoresque Fort. Morgan Road, entre les bornes 6 et 7, la communauté de Morgantown dispose de deux piscines et de deux courts de tennis. Il existe quatre accès à la plage communautaire et des promenades sur la seule plage accueillant les animaux de compagnie dans la région de Gulf Shores. Le quartier marche et fait du vélo amical. Malheureusement, cette propriété n'est pas disponible pour les groupes d'étudiants de la semaine de relâche. Les familles et les plus de 25 ans sont les bienvenus! "Changes in Attitude" est situé au 6112 Sawgrass Drive, Gulf Shores, AL 36542. Du 25 mai au 16 août, séjour de 7 nuits minimum avec enregistrement du samedi au samedi. Une salle de bain est située en bas et accessible de l'extérieur pour votre commodité en revenant de la plage ou des piscines. Rented house because it was next to the beach access boardwalk. We weren&#x2019;t told by Relax on the Beach that the boardwalk was closed for complete renovation during our stay. Only way to beach was through private property. Wi-Fi was not working the entire week. Called and emailed and no one got it fixed. Lots of maintenance needed on this house. Door frames and deck boards are rotted. Stove burners not working. Ryan, thanks for the feedback! The Morgantown Homeowner's Association is always working to repair, upgrade and update the community but Relax on the Beach does not receive advance notice of most projects. When we do hear in advance, we try and let guests know prior to arrival. We were not informed about the (now completed) boardwalk repair, most likely because there are two other boardwalks in Morgantown available for use. 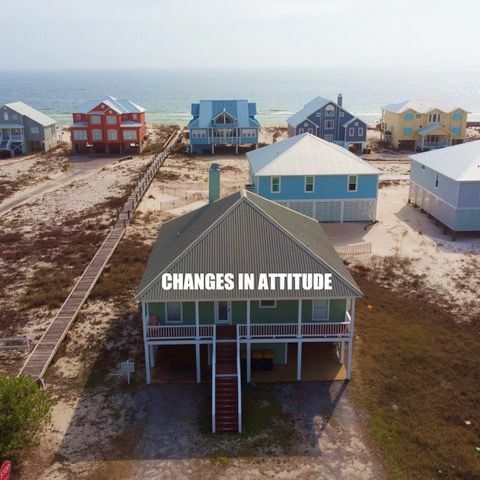 Because of the awesome location and proximity to the boardwalk and the pool, Changes in Attitude is an extremely popular property and it has been difficult to schedule repairs. We've made it a priority and screens, painting, railings and a new stove are a few of the updates scheduled for this property. We know you'll be pleased with the results and we hope to see you again! This was the sixth year we&#x2019;ve stayed at a Relax on the beach property. We were told this property was remodeled. They painted. No wall decor was put back on the walls. The location is great, next to the boardwalk to the gulf. Dog friendly beach. Great restaurant in Sassy Bass, near by. Many things need improvement at the beach house. Over all we enjoyed ourselves. As you can imagine, because of the home itself, the location and the views, Changes in Attitude is one of our more popular homes. We greatly appreciate your comments and will forward to our maintenance department to see if they can track down the missing art work. But we aren't surprised to hear that you enjoyed yourselves! It's hard not to! Let me start out by saying I love the house and it did fit our needs very well. However, before I rented the house for 2 weeks I sent 2 emails asking if the screens on the porch were going to be fixed. No response. A girl from the management company came by the house to check on us and we told her about the screens. She said she would send someone from maintenance out. No one ever came. My husband and I fixed the screens on the little porch ourselves so we could enjoy sitting out there which we did very much. Also in the reviews there were complaint about the stove Again, it was still not working properly. I love the house. I loved our stay. I just think management and maintenance need to step up. There is also a door threshold in the master bedroom in great need of repair. Great house just needs some TLC. Yes I would rent it again. Happy anniversary! The screens were part of a scheduled project. We should have done something temporaily for you, and we apologize that we did not. They have all been fixed now. We're not quite sure what is going on with the stove. We have had several people out to repair it and they all leave saying it is working properly. We're so glad that you love the house, and hope you'll come back again. We had a great time could have used an extra week.! !